A microcentrifuge is an essential piece of lab equipment for almost any lab performing any form of molecular biology. A microcentrifuge is used to spin down liquids in microcentrifuge tubes at high speed for sample separation, pelleting and various assay protocol steps. They can be refrigerated or non-refrigerated, depending on the model, and usually have a small benchtop footprint given their power. With multiple quick spin microcentrifuge and mini-centrifuge selections, Pipette.com offers you a one stop solution for your laboratory’s spinning needs. Whether you need to quickly spin a sample to pull all contents to the bottom of the microcentrifuge tube or separations in molecular processes, these affordable microcentrifuges are single button operations that make their use errorless. With low capacity, adapter rotors, and electronic breaks for quick deceleration to reduce handling time, the microcentrifuges offered at Pipette.com are great for low throughput laboratories performing simple centrifugation. Pipette.com offers a large selection of benchtop centrifuges including; Eppendorf Centrifuges, Oxford Centrifuges, Benchmark Centrifuges, Capp Centrifuges, Hermle Centrifuges, and Labnet Centrifuges. Not only are these compact centrifuges ideal for labs requiring spinning in their research or processes because of their cost and efficiency, but they are also extremely intuitive. Available in a simple quick spin, single button operation format for those rapid procedures or more advanced models with digital displays and programmable spin options, there is a centrifuge option to fit your needs. Eppendorf Microcentrifuges Eppendorf Minispin and Minispin Plus Microcentrifuges are whisper quiet—even when running without the rotor lid—to improve your work environment. They set new standards for silence, speed and simplicity! The operating concepts and overall design are based on in-depth ergonomic studies, making everyday routines faster and easier. Eppendorf Microcentrifuges are known for quality and durability. With today’s tight budgets Eppendorf Microcentrifuges will last and prevent you spending money on future repairs and maintance. 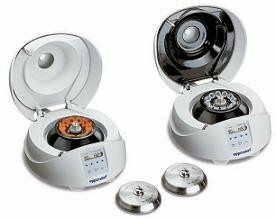 Pipette.com carries the complete line of Eppendorf Microcentrifuges, rotors and accessories. The Eppendorf tube is the microcentrifuge tube gold standard in labs that handle small volumes of liquids. In life science and biological labs, a microcentrifuge tube is used for all sorts of applications from sample storage to running reactions and spinning down or separating samples. Whatever experiments you are conducting, if you work with small volumes of 5 mL or less you will likely need microcentrifuge tubes in your lab. Synonymous with the Microcentrifuge Tube, the Eppendorf Microcentrifuge Tube (Eppendorf Tube), has built a name for itself in the scientific community with their superb quality and commitment to excellence. Check out our Eppendorf tube selection and special offers and promotions below. 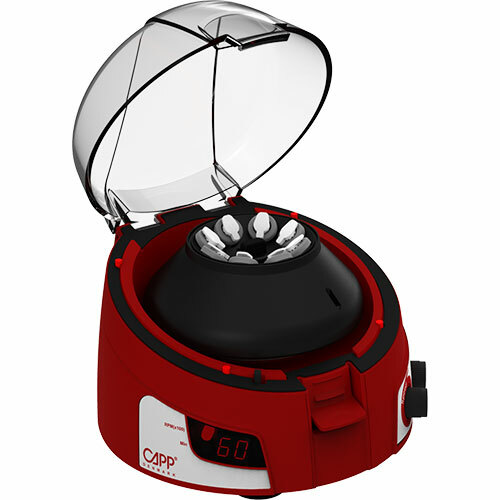 The CAPP Rondo microcentrifuge is much more than just a standard microcentrifuge, it’s an extremely quiet unit, even at full speed, and takes up very little benchtop space due to its small footprint. 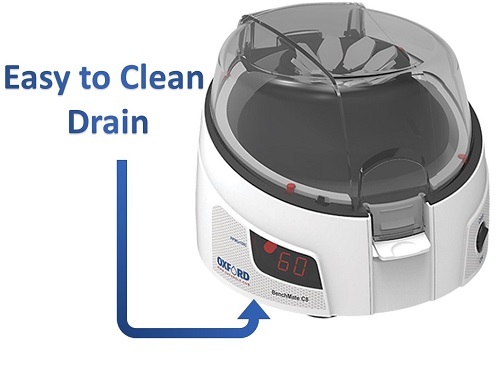 Equipped with high-quality suction pads, the CAPP Rondo microcentrifuge remains stable on the bench, even during extended duration runs at full speed. The vibrant red color of the CAPP Rondo microcentrifuge, combined with the elegant Danish design, will bring exuberant life and contrast to your lab environment. This microcentrifuge has a variable rotational speed up to a top centrifugation speed of 6,000 rpm/2,000 x g. The CAPP Rondo is suitable for 1.5 mL and 2.0 mL tubes. Smaller microcentrifuge tubes can be inserted using the accessory adaptors. The Oxford LP BenchMate C8 Micro Centrifuge – User-Friendly Features and Safety-Oriented Technology in a Compact and Robust Design. The BenchMate C8 Micro Centrifuge has proprietary technology making it one of the most user-friendly units on the market. The Electronic Safety Brake immediately stops the centrifuge upon the lid opening for superior user safety. The BenchMate C8 Micro Centrifuge has a fixed speed of 6000 rpm (2000 x g), a noise level of < 55 dB and is ideal for all quick spin centrifuge applications.